Salt River scored four times with two out in the top of the 1st, capped off by an Earl Weaver special by Spencer Kieboom (pictured) en route to a 5-3 win over Surprise. 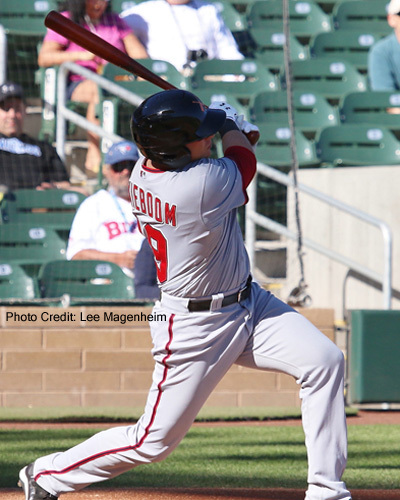 Kieboom was one of three Nationals to see game action yesterday afternoon. The 24-year-old batted sixth and caught, going 1-for-4 overall with a run, a HR, and three RBI. Defensively, he threw out one of two baserunners attempting to steal and finished with the two assists and seven putouts (all by way of the K). Drew Ward was the Rafters’ DH and reached base twice via the base-on-balls but was 0-for-2 otherwise. Dakota Bacus also appeared in the game, getting the last out for Salt River in the 6th and stranding two runners. In the 7th, he sandwiched a balk between two balks before being lifted but was bailed out when his successor, Kyle Regnault, got two groundballs and a whiff to stifle the would-be rally. The Scorpions lost their second straight but still lead the Rafters by two games with five left to play. Tonight, Salt River hosts Surprise in the AFL’s 2015 Military Appreciation Game. ‘Earl Weaver special’, I love it. The parent club could sure use someone like him right now. Jeff – 3B is a Harrisburg position without exciting talent in the pipeline, and I include Ward. Relying on OG is passable when there is organizational depth, and there is not. This is a critical year for catching in the organization. Lots of names but no one has truly stepped up and transcended. Kieboom really checks off the boxes for me, but I know that Severino floats others’ boat. Perhaps the two will arrive close enough in time that by 2017-18, one will be the starter and the other the backup. Sure would be nice to see both take off in Wilson’s walk year.